400년 전 마을이 생길 때 조성한 숲으로, 도천이라는 이름은 삼국시대이후 역로를 따라 내가 흐르는 마을이라 하여 길내 혹은 질내로 불리다 한자지명인 도천(道川)이 되었다. 한때는 숲의 규모가 산에서부터 하천을 따라 남쪽 국시당들까지 이어질 정도로 커서 이 ‘울타리’ 덕에 영덕 제일의 부자마을이었다고 하는데 화재와 경작 등으로 지금 규모로 줄어들게 되었다. 조성유래는 앞산의 뱀머리(사두혈) 형상이 마을을 위협하므로 이를 막기 위하여 풍수를 보완하는 목적으로 만들었다고 한다. 마을숲의 조성원리와 유래가 잘 남아있으며, 숲 안에는 대마를 땅 속 구덩이에서 삶아 옷을 만들던 ‘삼굿’이 남한에서 유일하게 남아있어 마을숲의 이용 등에 대한 학술적 가치가 있다. 숲의 당집에서 마을의 안녕과 풍년을 기원하는 당제를 대보름에 지내는데 마을청년들이 모두 참여하는 점이 독특하며, 한동안 마을을 떠날 때도 이 당집에 인사를 올리고 떠나고, 나뭇가지 하나라도 가져가지 않는 등 자연과 함께 한 선조의 의식을 보여주는 문화·민속적 가치를 지니고 있다. 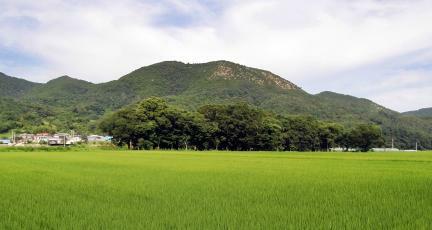 The Docheonsup Forest was developed some four hundred years ago when a village was formed nearby. The name of the village, “Docheon,” is the Sino-Korean equivalent of a vernacular name “Gilnae (Jilnae),” deriving from the Three Kingdoms period, which means a village with a creek running along the postal road. The forest once extended south along the stream, all the way to the village shrine, in a manner to fence in the village. This setting attracting well-off households from the environs, the village is said to have been one of the richest in Yeongdeok, once upon a time. Today, the forest has a significantly reduced expanse, due to fire and reclamation as farmland. The forest was originally developed to improve the feng-shui position of the village; concretely, to shield the village from the snake head-shaped summit of the mountain facing it which was believed to threaten the well-being of its inhabitants. This forest with a well-documented origin and known intent of development, is also notable for the only surviving samgut, a pit where hemp stems were boiled to obtain fiber to produce yarns, in Korea. The Docheonsup Forest, in other words, casts light on the ways village woodlands were used in traditional times. At the shrine inside the forest, a rite is held every year on the fifteenth of the lunar month of January, still today, to pray for the safety of village households and abundant harvest. This annual rite is said to be attended by all young men of the village. Villagers pay a visit to the shrine when leaving the village for an extended period of time and closely observe rules such as not disturbing any of its surrounding settings (not taking even a small twig away from the site, for example). As a vestige of a rural lifestyle in which emphasis was laid on harmony with nature, this forest retains great significance for the understanding of folk customs in Korea.